Are your computerised till systems ancient? Don’t waste valuable time and money on your old cash registers, what you need is our computerised tills. At CCM EPoS, we are dedicated to providing innovative solutions to the commercial and hospitality sector through till systems that guarantee to improve the operation and profits of your business. If you find it difficult to use and manage your old till machine, then it’s about time you get a new computerised till from CCM EPoS. Our tills are exactly what you need if you want to increase your sales and customer satisfaction. From retail to hospitality, the computerised till systems we deliver will be programmed to tailor your services. We understand, for example, that a shop will run differently to a restaurant. That’s the reason why every computer till we supply is specifically designed with functions appropriate for the tasks you’ll carry out. How do our computerised tills work? In this day and age, convenience is essential if you work with customers. The people that come into your store or restaurant will want great service and fast, and there’s no better way to do it than with our order pad solutions. This mobile invention is a portable version of your EPoS computerised till systems that will allow you to take orders with ease. Keep an eye on your stock and what’s selling with the online stock management solutions that are built into our computerised till systems. Should you choose it, we also have specialised cloud-based software to help you manage your sales information so that you make suitable changes to your business. One of the main reasons why commercial businesses might lose profits is usually because of an ineffective computerised till. Our tills are computerised so that they are simple to operate. Additional modern touches like the touch-screen pads and clear cut navigational software will mean implementing sales is no longer a chore. Now, with our computerised tills you can make any adaptations to your transactions with ease. 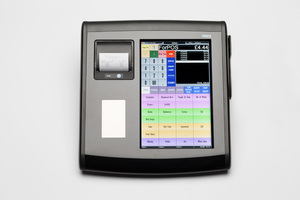 Unlike conventional cash registers, a computerised till supplied by CCM EPoS will afford you with a wide array of benefits. Tracking of customer purchases has now become so much easier enabling cashiers to process orders that much quicker. The ability to enable cashiers to look up prices, calculate change, and print receipts will also save your employees and customers precious time. Plus, even with a basic software package you will be able to perform functions such as tracking employee sales and correcting sales tax. For those concerned about security, you will find peace of mind in having a cash drawer that automatically locks, and can only be accessed with the correct password. Why choose a computerised till from CCM EPoS? Since our inception, CCM EPoS are a company that continually strives to deliver the most cutting-edge solutions around. Our state-of-the-art computerised tills have been designed to meet the demands of companies of all shapes and sizes. From start to finish, our team are committed to fulfilling your aspirations by supplying truly innovative solutions. Our aim is to make certain that your point of sale is functioning at optimal efficiency. By providing on-going support and consultancy, we will keep to our promise of helping your business to succeed in the midst of a challenging environment. At CCM EPoS, we are passionate about the quality of the computerised till systems that we provide, and this shows in the dedication of our team. If you would like to know more about what our computerised till solutions can do for you, do not hesitate to get in touch. If you have read this article and want to know more about computerised tills and the advantages it will bring to your business, make sure you contact CCM EPoS today.